High technology or cybercrime investigators from private industry, government, local, state, country and federal law enforcement agencies. Companies offering products or services in the field of high technology crimes or cybercrime. Educators interested in the field of high technology crimes or cybercrimes. The High Technology Crime Investigation Association (HTCIA) is one of the oldest, largest and most prestigious high technology crimes non-profit organizations in existence today. HTCIA’s primary focus is to encourage, promote, aid and affect the voluntary interchange of data, information, experience, ideas and knowledge about methods, processes, and techniques relating to high technology crime and cybercrime. We offer 16 distinct lectures over 2 days with social and professional networking amongst industry experts. Our exhibitors will also have an opportunity to “show off” their industry best tools during the Vendor Showcase. Become a member of the HTCIA - CLICK HERE! Speakers: Brandt Watkins-Vancouver Police Department, Digital Forensic Unit Sergeant, HTCIA International Executive Committee Secretary & Amol Gill- Director of Sales at ThoughtFarmer. Thursday & Friday: Continental Breakfast, Lunch, Snack and Reception. Refund/cancellation: HTCIA will honor a 90% refund if the registration is cancelled by April 9th, 2019. No refunds will be offered after April 9th, 2019. Substitutions will be accepted until May 1st, 2019. The Schedule of events is subject to change. 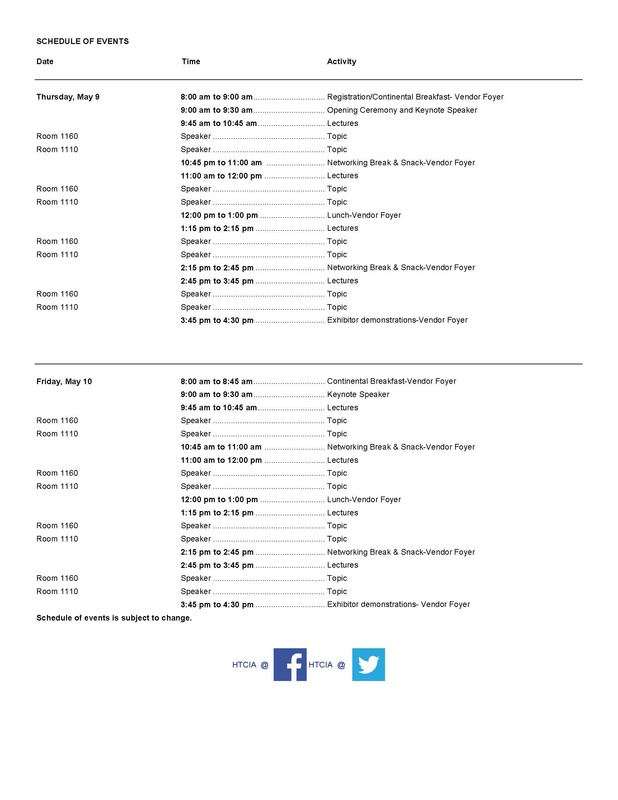 CLICK HERE to see the Full Schedule. If you have questions about hosting a Vendor Booth or becoming a Sponsor for the Canadian HTCIA Cyber Summit, please contact Anthony Reyes. 55 Laurier Avenue East, Ottawa, Ontario K1N 6N5.